Each (new) protel Air user will need to be assigned certain user roles. The role determines which parts of the program the user will be able to access. Open the stack menu and click on System > User administration > Users. A window opens containing an overview of all users. In the left part of the window, select the user for whom the user role is to be assigned. Click on the User roles tab and then on Add. In the next window, open the Role dropdown list - see next figure. To find out more about roles relevant to protel Air, see above. You also have access to internally generated roles. The standard protel Air user should at least be given the 'pAir Kundenrolle' (pAir Customer role) - or an internally generated role based on it. Select a desired role from the selection list (e.g., pAir Kundenrolle). Then, by clicking in the checkbox, you select the hotel in which the user is to have access to the role (multiple selection possible when necessary). Click on [Save] and close the window. 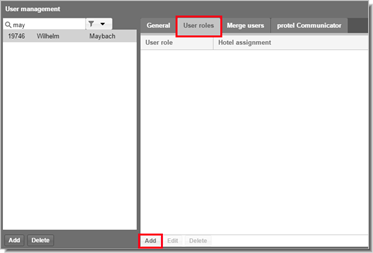 After saving, the role will appear with the respective hotel in the overview's User roles tab. You will need to allocate at least one user role for each newly created user. If the user hasn't been assigned a role, he will not be able to login to protel Air. Instead, he receives the following message: "User does not have any privileges".